AJ Ross has more on the traffic nightmare. WEEHAWKEN, New Jersey (WABC) -- Construction work began Friday night on the much-anticipated project to replace the Route 495 Bridge. For commuters, that means the approach to the Lincoln Tunnel could become a nightmare, with lane closures expected to snarl traffic for the next two-and-a-half years. The bridge itself is nearly 80 years old, and more than 150,000 motorists use it every day. It is now considered structurally deficient and functionally obsolete. Officials say the deck replacement work now getting underway is long overdue. Starting at 9 p.m., westbound traffic will be reduced from three lanes to two. The four eastbound lanes will be reduced to three, while the exclusive bus lane will remain. Officials say they are well aware of the impact on motorists who use the bridge on a regular basis. 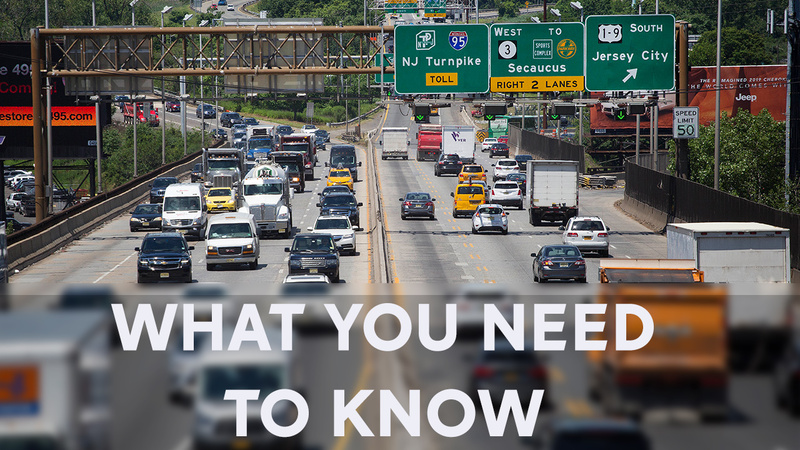 "We are very sensitive to the fact that this project is going to impact folks' lives for the next 2 and a half years," New Jersey Department of Transportation Commissioner Diane Gutierrez-Scaccetti said. "This is very fluid. We'll make adjustments as we have to, to move traffic as best as we can." Officials say the effects of the lane closures will be felt as soon as Monday morning, but the biggest impact won't come until September when the summer break ends. Officials say ferry and train riders can also expect to see larger crowds. Take a look at what to expect as lane closures are expected to snarl traffic for the next two-and-a-half years.